Recovery is going well, although my neck mobility is still very restricted after three months in a neck brace. 'Nereida' is safely docked in Victoria (RVYC) while I spend time in the warmth of Mexico, working on improving my general fitness as well as concentrating a lot on moving my neck more. I'lm looking forward to sailing in B.C. 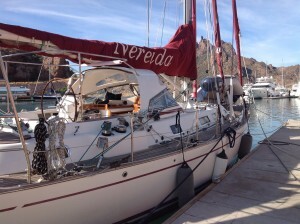 on board 'Nereida' over the summer, making sure my boat handling is OK despite my accident. There are a few jobs still to be done during that time but my hope is to be ready to leave in early October - headed south, solo nonstop, to Cape Horn and then on around the Southern Ocean before returning north. will sail around Antarctica in latitude 63 degrees south. side so as to lengthen his orthodromic track to the minimum distance. It was lovely to get away from the dock for six days last week with friends Tom & Maggie who had joined me the week before on board “Nereida”. Outstanding jobs to be done on board – none of them critical – would have to wait, although the dinghy was inflated, the outboard was run to check it and the diesel was topped up. I’d stocked up with plenty of fruit juices, fresh fruit, eggs, cheese and vegetables so we would eat well while at anchor..
We had hoped to sail but with light winds from astern, we motored most of the 42 miles from La Cruz, around Punta de Mita and on to Chacala – a lovely anchorage with good holding, although open to SW swell which, sure enough, made itself felt but not so badly that it became a problem – we were rocked gently to sleep. Surfers enjoy the waves along the beach just south of there. We were keen to get to historic San Blas so, instead of dinghying ashore, we left soon after a leisurely breakfast of fresh papaya. I overlaid the radar over the chart on the plotter – the old Mexican charts are renowned for being unreliable and the radar image showed the land to be generally over one and a half miles further east than the chart placed it. Our track several times passed over ‘land’! Passing Punta Los Custodios, with rocks awash shown as well offshore, we kept our eyes glued to the depth display but we were in plenty of water all the way. Our final destination was Bahía Matanchén – a wide open anchorage with a long curving beach fringed by palms and lines of ‘palapas’ – beach restaurants roofed with palm fronds to shade the many (empty) chairs and tables set out on the fine sand. The long beach to our east, running south, was scattered with small houses and behind it, the jungle-covered mountains rose high. The old town and river-port of San Blas lay a short distance around a point to the NW with the coast highway passing an easy walking distance from the beach. Ishmael runs a palapa conveniently close to a good landing spot for the dinghy and kept an eye on it while we were away in exchange for a drink and a tip on our return. The swell was minimal into the bay and made for a fairly easy landing – getting wet feet and legs is all part of the normal dinghy-beaching routine! We had been advised to anchor well out in the shallow bay so we were ¾ mile out and several other boats came in and anchored even further out. The reason? No-see-ums, or ‘jejenas’ to the Mexicans …. These minute, pin-head-sized insects are difficult to see and have a disproportionately painful bite and, so the Mexicans will tell you, laugh “he-he” as they do so…. usually around sunset and sunrise. I’d asked my friends to bring a big double mosquito net with them, thinking it might be needed over their bunk, but they rigged it up over half the cockpit so we could sit out and enjoy the sunset and fresh air without being bitten – it worked well after a few attempts to drape it high up enough while still reaching the cockpit floor. We spent a very lazy Sunday at anchor in the peaceful, sunny bay. Every now and then, we’d hear a splash as the pelican that seemed to have adopted the boat dived after the many fish that sheltered underneath us and a small group of chirping swallows were busily exploring various perches on the boat. We finally went ashore just in time to meet up on the beach with some other boaters – one of whom I knew. They were able to advise us on getting in to town and making the river trip we’d heard about, as well as pointing out Ishmael’s palapa to us. Monday we took a taxi into town – the local bus we would have preferred seemed to be rather infrequent and we had made a late start again. San Blas is an old town "San Blas was founded in 1531, but the official date of founding is 1768, when Don Manuel Rivera and 116 families arrived . 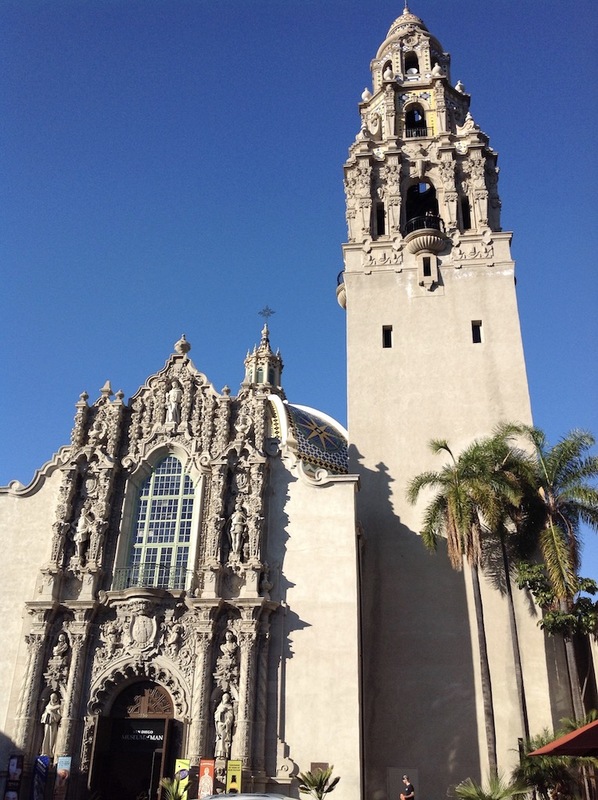 It was the port from which the Spanish priest Junípero Serra, Father President of the California Missions, departed for California. He left on March 12, 1768 from the nearby Las Islitas beach on Matanchen Bay, in the locally built barque Purísima Concepción. In May 1768, San Blas was designated as a new naval base for the Spanish Navy. A fort was built high up on a rocky escarpment overlooking the town with excellent views far over the surrounding area – three sides have steep rocky faces. The fort has recently been renovated and the church close by is impressive despite its lack of roof. The US poet Longfellow is well-known in the town for his poem ‘The Bells of San Blas’, some or all of which we found inscribed on walls in several places, including, of course, the old church it referred to. (This was Longfellow's last poem, finished days before his death but he never visited the town.) Apart from a beautiful old hotel near the riverside harbour area, with a lovely courtyard at its centre, and other occasional well-kept buildings, most of the town was looking rather dilapidated and the roads were mainly of big, old cobbles. Amusingly, the town square has an enormous Christmas Tree construction which seems to be a permanent feature. The town market building stood opposite one corner of the square and Huichol Indian women were selling their many traditional bead items under the shady trees along one side of the square – I was very tempted, they are so colourful and delicate. Tuesday we took the Tobara River trip in a typical open Mexican ‘panga’, our guide Juanito driving us through the winding river between thick mangroves near the beach, the greenery slowly getting less dense finally to become reed beds with occasional trees as the view opened up to the distant mountains. Being around midday, with the sun beating down out of a clear sky, it wasn’t the best time for bird activity, but in or below trees at the river’s edge we saw a variety of birds, crocodiles, a turtle and some big termite mounds high up. We returned at speed, with Juanito swinging us around the many bends in great style – good fun! A fresh fish ceviche was prepared for us by Ishmael before we dinghied back to the boat for a relaxing sundowner. We all agreed we’d like to return to Matanchén Bay and San Blas sometime but now it was time to make an early morning start back down to Punta de Mita where we anchored peacefully overnight before returning to the marina in La Cruz –Tom and Maggie had a flight to catch to Vancouver. Memorable moments included whales spouting in the distance, two fishermen frantically waving us inshore of their unseen fishing net, a large turtle swimming past the boat and lots of small brown rays swimming with upturned wingtips in Matanchén Bay. From the harbor of Mazatlan? Nothing more to master or man. And are something more than a name. And the meaning is manifold. And the Priest was lord of the land. And are green with mould and rust. "Is, then, the old faith dead,"
Like the white souls of the saints. The hands that believe and build. That the Priest is lord of the land!" Ye call back the Past again! The old solar panels have been replaced with two large new ones, with lots of help from Joseph DiMatteo (and his friend Tony) who drove me back down with them from Tucson to San Carlos just over a week ago - very many thanks for all his efforts and help. 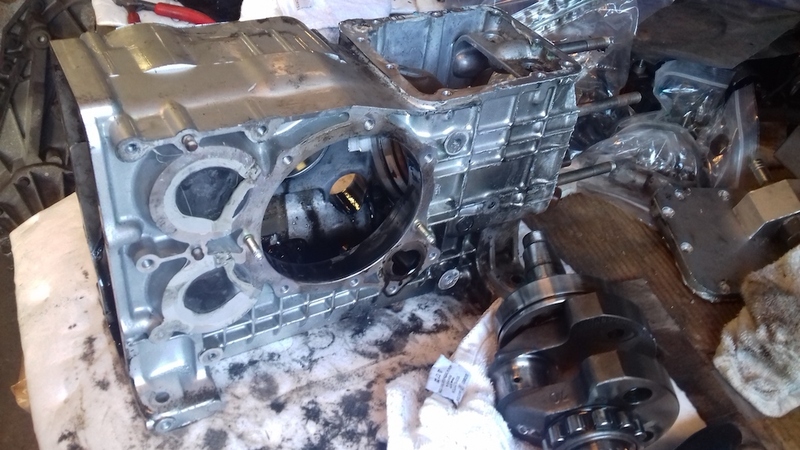 My outboard motor has also been repaired, despite the main part I brought out from England not being correct, so the old part had to be welded together for re-use - it's probably now stronger than it was and certainly the motor seems to be running fine. I wanted to get away as soon as possible for several rreasons, .... and the cold night air in San Carlos at this time of year was certainly a contributing factor! As it turned out, there has been a very strong 'Norther' blowing for most of the week, giving nasty short seas. It was due to abate this weekend - which galvanised me into trying to be ready to leave during that 'weather window', so as to meet up with friends in La Cruz soon... 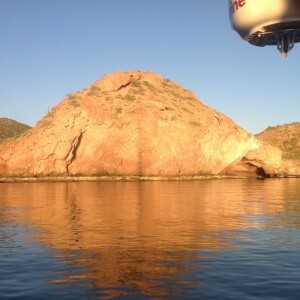 It's a five-day passage to La Cruz from San Carlos, with a possible brief stop at Mazatlan on the way. Tom and Bobbi, with crew Martin, are maknig the passage to Mazatlan on 'Persistence' and we're keeping in radio contact. They left several hours before I did (I needed some sleep before leaving!) and so are about 30 miles ahead of me - useful, since if they see any problem fishing activity, they can let me know. Shrimpers are busy now and other small fishing boats are also a worry on an overnight pasage hereabouts - especially the unlit ones! Unlit fishing nets and the chance of meeting a long-liner (illegal but they're around) add to the worry... So far I've not seen any small fishing boats but I've deliberately kept well offshore in the hope of avoiding most of vthem - but it's early days yet. Mid-afternoon, it was good to be playing with the sails again, when the onshore breeze strengthened - but a few hours later the sails were flapping in the light wind again and motor-sailing turned to motoring once more - I keep checking on deck, hopeful of making good use of the sails again. Sunset was beautiful tonight, enhanced by the far away mountain tops of the Baja, loooking for all the world like nearby islands outlined in black against the rosy sky, with a big, orange, full moon rising in the East. December 2015 - Rudder nicely repaired ... back afloat! That date was the last possible date for launching before next March, or maybe even April, in view of the tides becoming smaller over the winter here in the Sea of Cortez - so being ready in time was critical! I enjoyed being afloat alongside the dock where the dive boat 'Ocean Sport' was moored. close to the table where freshly-caught fish were weighed, cleaned and dealt with - I received a chunk of marlin one day from one of the generous Mexicans which gave me an excuse to cook some ratatouille later to go with it - lovely! Cruisers dinghying out to their boats in the Bahia, as well as pangas and tourist boats, regularly passed by and waved - all very sociable! Nice to be afloat again with an intact rudder! And the bimini support had finally been installed while on the hard - incredible... only one year later than I'd hoped! After a trip to Europe over the 'holiday' season, I'll be driven back to 'Nereida' from Phoenix by Joseph DiMatteo of Tucson S.C., ready to instal two new 150W solar panels we'll be taking down with us. Joseph has been amazingly helpful in talking to Solar World who are generously replacing all four panels under warranty - the old ones had degraded in places and were no longer producing the power they should have been. I'll be looking forward to seeing a big increase in the amps produced by the new PV panels to charge the battery bank. Many thanks to Solar World and to Joseph. Merry Christmas and a Happy, Healthy, Peaceful New Year 2016 to you all! On my return to Nereida early in October, it was nice to reconnect with familiar people around the marina, which suddenly became far busier with cruisers increasingly returning to launch boats safely stored in San Carlos over the heat of the summer and hurricane season, to ready them for sailing in the far pleasanter, cooler, winter weather. Days suddenly became pleasantly warm and nights cool. I’d been looking forward to seeing more of the Sea of Cortez but first wanted to finish a few more boat projects – among them fixing a hatch mosquito screen in the forepeak, which I needed help with since it needed two pairs of hands, and getting a bimini (cockpit sun shade) support organized. That last item has been frustratingly difficult to make progress on for several months, with the work continually not being started as promised…. This is Mexico! I finally got away from the dock at San Carlos around one o’clock on Wed 28th October after a prolonged Internet session at nearby Tequila’s (there’d be no Internet possibility once away) and having spent quite a time securing 3 newly-filled propane tanks in the gas locker, organizing the dinghy and stowing my fold-up bike. I had to get into the engine compartment to operate the emergency solenoid fuel cut-off. Fortunately, I knew where to find it but was worried that the engine was hot and I had to reach down the far side of it…. 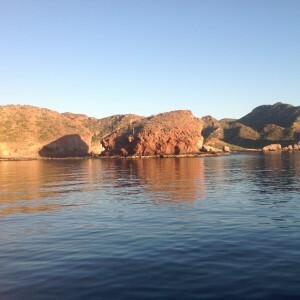 It was a big relief when it stopped and I was able to relax and enjoy the dramatic view of pink, high, well-eroded-sandstone rocks and hills – so typical of the Sea of Cortez coastline and made even more spectacular as the sun began to set. Where I’d anchored is reasonably well-protected from north winds – sudden, strong Northers being the main worry over the winter months. With good, accurate, weather information difficult to come by in this area, it’s best to be safe and head for such protected anchorages, despite the frequent flat calm encountered on the way. After cooking a meal, I planned my forthcoming passages over to Puerto Refugio and Este Ton, both on Isla Ángel de la Guarda, off the Baja coast, using two pilot books giving anchorages in the area – and also my iPad which I’d loaded, using Tequila’s Internet access, with detailed Google Earth photos of the coast and islands to back up other information. From weather info given the next morning (Thursday) on several HF radio Nets and also from grib files I’d downloaded, it was clear a Norther ‘blow’ was expected – on Friday, they all said… So I decided to head to a “textbook” secure anchorage a short distance further north, to wait for the Norther to pass. Ensenada Julio Villa was certainly very calm, with none of the fair-sized SW swell which had built up entering it, but the cove was a lot smaller than I expected and also rather shallow. Tidal info is not available for a lot of the Sea of Cortez so I ‘guesstimated’ the time and height of Low Water that evening by reference to a place on the other side of the Sea at a similar latitude. .
Anchoring in 12 feet (3.7 (m) of water, well away from the entrance rocks, did not feel too good but it was around mid-tide as I checked the depth on display using a lead line – it was over-reading just 8 inches (0.2m) – not normally a problem… I snorkelled to check on the seabed below the keel and found sand with lots of small boulders. But later, when 9ft was shown and not knowing exactly how soon LW was expected, I moved closer to the entrance while there was still good daylight, re-anchoring in deeper water but still protected from the waves outside… But we were now a little closer to the rocks on either side of the entrance and I could not deploy as much chain as I would have liked since it would place us too close to the rocks astern. When the expected strong NW wind came, the extended chain would place us even closer to them. I thought about deploying a second anchor but that doesn’t leave much freedom for a quick escape if needed.… and there wasn’t anywhere else close by to make for that would give protection from the NW. As soon as pitch darkness had fallen, before moonrise, the wind quickly began to build and I heard occasional sounds from the bow so I went there thinking maybe I should organize a snubber (closing hatches on the way as I did so!) – but soon realized that the anchor was beginning to drag – and almost immediately felt and heard it dragging a lot… The high rocky hill astern loomed closer in the darkness. I dived back to the wheel and turned on the engine – but we were already on the rocks with the wind, now 28-30 knots, trying to push us further on. I could see one rock glistening black at the water surface close by to port and the rudder would only move a small amount either way, so clearly there were rocks to either side of it or it was already stuck in a crevice - but the water depth (near the bow) was reading 9ft. Desperately trying to save the boat, I powered the motor to maximum revs, hoping to prevent us from being driven further onto the rocks by the wind. Nothing happened and I was thinking, “If I have to keep on like this for some time (until after the tide turned, in several hours’ time, maybe), so be it – anything to prevent us getting damaged by from going further onto the rocks. There’s no-one around to help…” I could hear occasional crunching under the keel from the rocks there but my impression was that the hull was, so far, clear of danger. After an age not making any progress, I suddenly felt a small forward movement – and then we bumped away and off the rocks…. What relief! Steering us in the direction of the cove entrance proved surprisingly difficult (clearly not helped by chain and anchor being still deployed) and as we seemed to veer out of control and head to the beach, I was fearful we’d end up in more trouble, but she finally responded to my steering efforts and we made it out of the cove and into open water – where the seas had already built substantially – definitely a ‘washing machine’ action…! The anchor and chain needed to be taken in urgently. I reduced the revs a little to make it easier and kept us making headway towards deeper water, away from the headland where the cove lay, although only making about 2kt into the 30kt headwind. Switching to autopilot, I went forward to a bow that was crashing into the rough seas. The moon had still not risen yet but the navlights I’d hurriedly gone below to switch on showed just how rough and big the seas were – tossing us around like the proverbial cork, with resulting chaos down below. As we headed south towards San Carlos (a safe haven, for sure), our slow change of direction, as we followed the coast well offshore, gradually brought the oncoming seas abaft our beam – lessening slightly the violent motion. 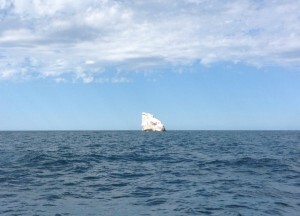 Eventually we were running downwind – although still being tossed round in rather confused, angry seas. I was thoroughly relieved that, when headed north, I’d circled a big, high rock (El Acero – the Sword), partly to look for a colony of sea-lions said to inhabit it and partly because it was well over a mile off the coast, rather than just the ½ mile shown on the chart. If I hadn’t marked its position on my plotter, I could possibly have run into it in the darkness but I was now able to steer well clear of it. Reaching San Carlos, nearly thirty miles away, took until gone 2a.m. with nowhere else to take refuge. 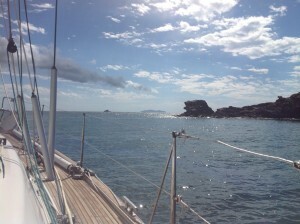 Entering the Bahia, the seas calmed and the wind died – despite 20 knots of wind and rough seas just outside. The high twin peaks of Tetakawi – the distinctive symbol of San Carlos – and the other high hills around give the harbour wonderful protection from the north. On trying to drop the anchor in the tranquil bay to get a much-needed rest, I discovered it was firmly wedged and refused to move, despite prolonged hammering in an effort to free it…. I was not inclined to struggle in the dark with readying my secondary anchor at that point – far simpler to get fenders and lines ready and cautiously make my way through the badly lit channel, past mostly unlit boats, piles and docks to the marina Fuel Dock – empty… Great! Postscript: The rudder had been damaged – the bottom was broken off (which possibly was the reason for my steering problem immediately after getting free if it was still partly attached for a time) - but the greater part of it was still there. Being a sturdily-made semi skeg-hung rudder meant I came off the rocks with a rudder to steer with, rather than the entire rudder being torn away and/or bent, as some might well have been. The propeller (a Brunton’s Autoprop) was fine and had, as usual, performed well and the hull was totally undamaged, as I’d thought. Some small sections on the base of the lead keel were slightly dented – but nothing major. “Nereida” is now on the hard in San Carlos - the Mexicans excel at this kind of repair. I'd motored, in v. little wind, N from Cala Puertocito del Enmedio.. The only drawback to the place, apart from the chart being totally misleading on the approach, was the bees that came looking for fresh water - and found my mug of tea! I spent a time yesterday working on getting my dinghy and outboard working. The dinghy floor had deflated after I'd tried to pump it up and so needed quite a time to bring it up to pressure, and the outboard kept refusing to start - but eventually did so and I triumphantly went on a tour of the bay and nearby rocks... Lowering and raising the motor using my handybilly worked fine, although it took a time tying the dinghy alongside 'Nereida' each time. Before leaving Bahia Quemado, Eric ('Scoots') came on board and got my GoPro camera working and also, while it was charging up, made up the aerial for a little receiver I have to download satellite weather pictures in real time - a useful tool, especially in hurricane season! More exploring - on the way here today, I went in to Port San Juan - a 'hurricane hole and I also explored the area S of the sand bar to the N of this anchorage - but aborted quickly when I found the depths suddenly getting down to 9-11 feet (Nereida's draught is just under 7 feet!). As soon as I'd anchored, 'Linger Longer' came on the radio to tell me that a whale shark was close by - I spotted the rounded dorsal fin twice - but got no more sighting of it... They said they'd seen three of these large but harmless basking sharks in the area! Videos shown this evening confirmed their sightings - they're BIG!! The day ended with a good sociable evening on board 'Scoots' - 'Summer' and 'Azul' joining in for what was, for me, a farewell ... Tomorrow, I'll be making for Santa Rosalia on my way to San Carlos and a visit back to the U.K. in early September. This morning I twice heard two short barks followed by a short howl - a coyote? The steep wild mountainsides around this cove are full of all sizes of caves - perfect for wildlife and no wonder I saw a bat last night. I decided it was time for some house- and boat-work, one urgent job involving the log impellor which had stopped working. I'd been meaning to clean it for a time, and it has clearly been under-reading, but now it was telling me nothing but sea temperature. I protected the bilge area around it with paper towels and old cloths, blocking off the limber hole - I like to stop as much seawater as possible from getting down further into the main bilge - and then pulled out the impellor, blocking up the hole quickly with the blank. That clearly needed more grease around it because a small trickle of seawater refused to stop No worries - I just had to work quickly. It was no wonder the impellor had stopped turning - it had several wormy things together with lots of calcareous tube-like deposits (their 'homes'?) and even the tiniest of shells was beginning to grow in there. It proved impossible to clean in situ so I had to remove the impellor from its housing - nice to be both the chef and bosun - a galley chopping board was useful when banging out the pin! By 2pm, it was replaced and the area seen to be bone dry - no leaks... so the floor was replaced... job done. Time for a snorkel session on the rocks on the W side of the cove. I saw dark grey clouds and heard frequent rumbling of thunder but we were right on the edge of it. Any rain and worse weather was heading W and keeping out of sight, behind the mountains backing the cove (the Sierras Agua de Soda!!) - out to sea the sky was blue. Plenty of fish, with several large shoals. Sting rays in the sand on the way. A good-sized vivid all-orange long slim fish - unmissable among the duller fish - a first for me! No Cortez damsels but several large yellow/black/silver banded damsels - seen often before but I've no idea what they're called. The seabed below the rock face was a jumble of large boulders - a wonderful hiding ground for these fish - no wonder they were so varied and plentiful. 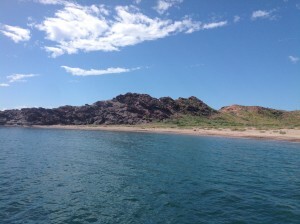 I snorkelled eastward out from land to see how far the rocky bottom extended - quite a way...! So then I checked on my anchor - it was safely in nice sand, so no worries there. I continued on towards the E side of the cove - the sandy bottom continued most of the way to an exposed ridge of high, tooth-lke rocks inshore from a small sandy beach and on towards the S shore also, where the sandy seabed was quite steep-to. Clearly, there is quite a large area of safe sandy anchorage at around 20ft/7m well inside the cove - you just have to know it's there, in from the rocks further offshore. Beautiful starry night ... Bright moon reflected in calm water and lighting up rock faces.. Rays swimming nearby, occasionally jumping... Who would want to be anywhere else?? This is a very rugged, deserted coastline, making landfall difficult. . We arrived just before sunset today in a small cove bordered to NW and NE by jagged rocks, with sandy beach on S shore, backed by steep-sided, barren, pink mountains and a deep valley, with some greenery, leading off to the W.
It was a very nail-biting approach, rather like approach to Isla Partida after a fabulous downwind sail on Saturday, both times knowing the chart is totally unreliable and there are rocks possibly hidden just below sea level. Correct line of approach, in both cases, was vital but difficult to be sure of... I stayed in deep water for as long as possible and slowed right down a long way out.. Hitting an unseen, uncharted rock at slow speed is more likely to be survivable than at greater speed! But I stayed safe both times. I didn't feel very comfortable on seeing depths down to 30 ft and less when still well offshore but they suddenly dropped to show deep water again until we were very close to the cove entrance (display was due to either hidden rocks or fish) . I had radar on to show position of land and rocks on Saturday also, but it got very confusing today, with multiple echoes. Once close enough to see the lay of the land (and rocky outcrops) clearly, life became a lot less stressful and I anchored in sand at under 20ft/7m in very calm conditions. Surprisingly, with so much overcast, I later spotted the Space Station, shining brightly as it approached the moon and headed on SE in clearer sky. I'm looking forward to snorkelling around the rocks here tomorrow, hoping the fish will be more varied than off Isla Partida. There, I'd gone snorkelling with "Scoots" and "Azul" - Mike explained how to spot scallops and clams lying on the sea bed or on rocks, often well-camouflaged with growth. I saw what looked suspiciously like a giant squid (Humboldt squid) lying half-hidden in a rocky recess - they're aggressive so I did NOT approach too closely...!! Later, we all got together for a sociable meal on 'Azul' - Mike was a good cook of the seafood that had been gathered that day! 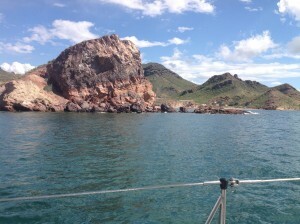 The geology of Isla Partida is fascinating, with clear volcanic rock formations - a caldera? I was reminded of the Giant's Causeway in Ireland, with similar rock structure, like enormous rhombic 'crystals'. Partida was pleasantly cooled by sea breezes - and there were no bees desperate for fresh water to make life difficult - the island was far too barren for bees to exist there. It also had currents through the anchorage that made the boats swing about a lot - often we'd all be pointing in different directions. Lazy day on Thurs, after getting up early to speak on radio - firstly to cruisers' Sonrisa Net and then, for quite a time, to West coast friends (and to station in Sydney, Aus) on 7151 - good clear signals from everyone. Fires in Pacific NW and B.C. are still raging badly - they desperately need sme rain and less wind if fires are to be brought under control. Firemen being killed and burned in efforts to cope. Went snorkelling over to rocks on S side of bay - plenty of fish, from newly-hatched to usual large ones, some in shoals. Continued around to sandy beach - piles of pearl oyster shells - brought several back - they're beautiful! Rays are frequently jumping, even at night, and after sunset, dark shapes of pelicans are close by and tonight had a pair of sealions swimming around. Navy boat from DSanta Rosalia was stationed close by most of the day and overnight - could hear its chain snatching in the slight swell - must surely have disturbed their sleep. Missed seeing the Space Stn - 'Scoots' said they thought it was not bright and were also not sure if they'd seen it - we'll try again when it passes over on Saturday. The Japanese craft should be closing in on it then. Spent evening with 'Scoots' - we're both heading for Isla Partida tomorrow. I'm thinking of staying two nights before heading for Animas and eventually over to Bahia de Los Angeles briefly, before heading S again.